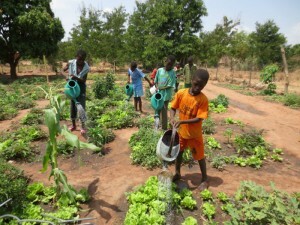 Slow Food’s African food gardens follow the philosophy of good, clean and fair. But what does this mean in practice, and what makes them different from other food gardens? 1. They are created by a community. 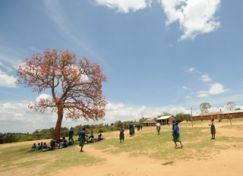 The gardens bring together and value the capacities of all the community members uniting different generations and social groups (village or school associations, local administrators or non profit organizations). They recover the wisdom of older generations, make the most of the energy and creativity of younger people, and benefit from the skills of experts. 2. They are based on observation. Before planting a garden, it is necessary to learn to observe and to get to know the terrain, local varieties and water sources. The garden must be adapted to its surroundings, and local materials should be used to make fencing, compost bins and nurseries. 3. They do not need a large amount of space. 4. They are places of biodiversity. Slow Food gardens are places for local biodiversity, which has adapted to the climate and terrain thanks to human selection. These nutritious and hardy varieties do not need chemical fertilizers and pesticides: vegetables, medicinal plants, culinary herbs and fruits trees (bananas, mangos, citrus). 5. They produce their own seeds. 6. They are cultivated using sustainable methods. 8. They are open-air classrooms. 9. They are useful, but also fun. Food gardens are a simple and inexpensive way of providing healthy and nutritious food. But even in the most remote villages and the poorest schools, Slow Food gardens are also a place for games, celebrations and fun. 10. They are networked together. Neighboring gardens exchange seeds, while those further away exchange ideas and information. The coordinators meet, write to each other and collaborate. Twinnings between school and convivia from all over the world allows the creation of new gardens across the continent. 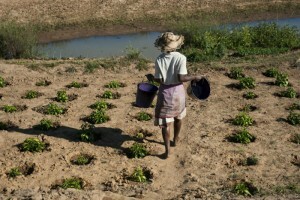 A food garden is a drop in the ocean compared to the problems Africa faces every day. But if the number of gardens grows from a hundred to a thousand to ten thousand, and they dialog together and support each other, their impact grows. Together, they can transform into a single voice, speaking out against land grabbing, GMOs and intensive agriculture, and in favor of traditional knowledge, sustainability and food sovereignty. And they can represent a hope for thousands of young people. 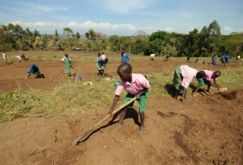 To create 10,000 food gardens it is essential to construct and train a network of African leaders. 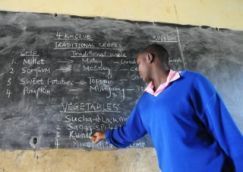 This is why the Slow Food Foundation is committed to supporting the work of the local coordinators, expanding the network of African experts (agronomists and veterinarians), organizing experience exchanges and funding scholarships for young Africans to study at the University of Gastronomic Sciences.